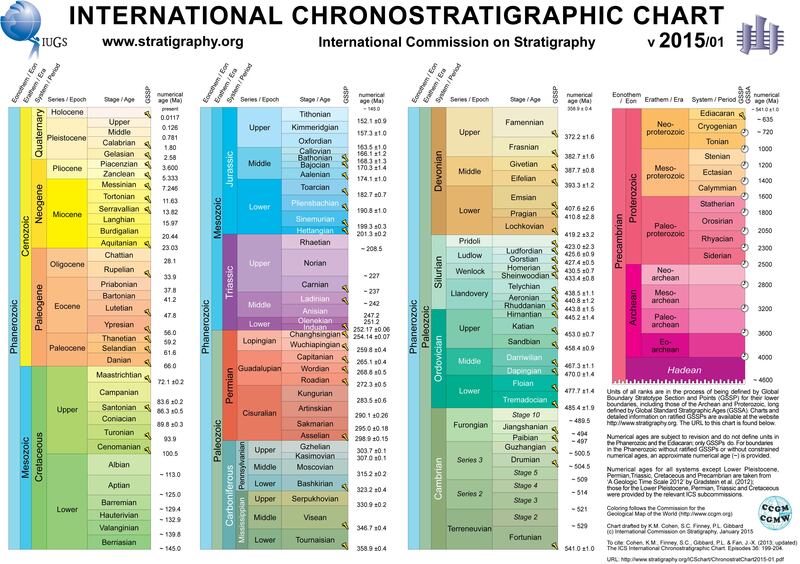 The Quaternary Period (/kwəˈtɜːrnəri/) is the current and most recent of the three periods of the Cenozoic Era in the geologic time scale of the International Commission on Stratigraphy (ICS). It follows the Neogene Period and spans from 2.588 ± 0.005 million years ago to the present. The Quaternary Period is divided into two epochs: the Pleistocene (2.588 million years ago to 11.7 thousand years ago) and the Holocene (11.7 thousand years ago to today). The informal term "Late Quaternary" refers to the past 0.5–1.0 million years. The Quaternary period is typically defined by the cyclic growth and decay of continental ice sheets driven by Milankovitch cycles and the associated climate and environmental changes that occurred. The term Quaternary ("fourth") was proposed by Giovanni Arduino in 1759 for alluvial deposits in the Po River valley in northern Italy. It was introduced by Jules Desnoyers in 1829 for sediments of France's Seine Basin that seemed clearly to be younger than Tertiary Period rocks. The Quaternary Period follows the Neogene Period and extends to the present. The Quaternary covers the time span of glaciations classified as the Pleistocene, and includes the present interglacial period, the Holocene. The Anthropocene has been proposed as a third epoch as a mark of the anthropogenic impact on the global environment starting with the Industrial Revolution, or about 200 years ago. The Anthropocene is not officially designated by the ICS, however, but a working group is currently aiming to complete a proposal for the creation of an epoch or sub-period by 2016. The 2.6 million years of the Quaternary represents the time during which recognizable humans existed. Over this short time period, there has been relatively little change in the distribution of the continents due to plate tectonics. Glaciation took place repeatedly during the Quaternary Ice Age – a term coined by Schimper in 1839 that began with the start of the Quaternary about 2.58 Mya and continues to the present-day. During this time, substantial glaciers advanced and retreated over much of North America and Europe, parts of South America and Asia, and all of Antarctica. The Great Lakes formed and giant mammals thrived in parts of North America and Eurasia not covered in ice. These mammals became extinct when the glacial period Age ended about 11,700 years ago. Modern humans evolved about 190,000 years ago (source: Leakey). During the Quaternary period, mammals, flowering plants, and insects dominated the land. This page was last modified on 12 January 2016, at 06:26.